Having straight, even teeth can transform the look of your smile, giving you an incredible boost of confidence while even improving your oral health. If your teeth are crooked or misaligned, you may be considering options for straightening your teeth, worried that your only solution could be traditional metal braces that are unattractive, uncomfortable, and take years to work. There are actually three teeth common straightening options for adults: traditional braces, Invisalign®, and six-month braces. To help you determine the most effective and fastest way to achieve the smile you want, we are comparing your three main options. Traditional braces with metal bands and brackets are fixed, meaning they are bonded to the teeth and can only be removed by an orthodontist. Once the bands and brackets are affixed to the teeth, an archwire on both the upper and lower teeth connects the bands and brackets and is periodically tightened or shifted, pulling teeth into place. Pain and pressure – As the wires pull teeth into place, especially for the first few days after each adjustment, people may experience soreness and aching. Additionally, new brackets and wires can cause small scratches on the inside of the mouth. Highly noticeable – The metal “train track” look is very conspicuous, especially on adult uses. Difficult to Clean – Because they are cemented to your teeth, food can easily get stuck in the wires, plaque can build up, and they require closer attention when brushing and flossing to prevent decay and cavities. Orthodontist visits – Regular visits to get archwires adjusted and tightened are necessary, but often inconvenient. 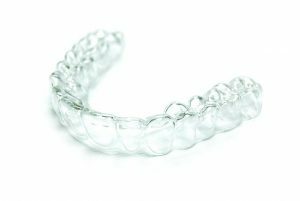 Invisalign® is a clear aligner treatment that works as an excellent alternative to traditional braces, especially for adult patients. Perfect for adjusting mild to moderate crowding and spacing issues or realigning teeth that have shifted after traditional braces, Invisalign® fits snugly over teeth, gently and effectively shifting them into a straight, even position. Every one to two weeks, new aligners are used to gradually shift the teeth, instead of having to tighten wires. When worn as directed, most patients only have to wear Invisalign® between nine and 15 months. Comfortable and painless – Because there are no wires to tighten or metal, users don’t feel pain, pressure, or get cuts in their mouth like with traditional braces. Transparent and inconspicuous – They are clear and fit over the teeth, so no one can even tell you’re wearing them. Removable – While it’s important to wear them 20 to 22 hours a day, you can remove your aligners so you can eat what you want and, more importantly, so you can brush and floss easily and effectively. Convenient – Your cosmetic dentist can take care of getting you fitted and set up with your Invisalign® aligners. Six Month Braces are a relatively new straightening option that puts an updated twist to traditional braces. While they use wires and brackets like traditional braces, there are some key changes. Most notably, they are only used on visible, front teeth and are designed solely for cosmetic straightening purposes, as opposed to traditional braces that can also fix bite problems and complex issues. There are two major differences between Six Month Braces and traditional braces. First, because they are only used on the front teeth, results can be achieved in four to nine months. Also, instead of silver, metal wires and brackets, Six Month Braces use clear brackets and tooth colored wires. While they are still noticeable in close quarters, they aren’t quite as apparent as traditional braces. Limited results: Because this is a limited option for front teeth only, patients find that the way their teeth bite hasn’t been repaired, and often adjustments are minimal. Discomfort and pain: While there isn’t as much pressure as with traditional archwires, there may be soreness and even scratches on the inside of the mouth. Fixed appliance: Unlike Invisalign®, Six Month Braces are attached much like traditional braces, which can also cause difficulty in brushing, flossing, and caring for your teeth. Contact Our Holly Springs Cosmetic Dentist to Learn More! If you’re ready to take the first step toward achieving a straight, even smile, the cosmetic dentists at Sninski & Schmitt Family Dentistry are here to help! We are proud providers of Invisalign® and have seen tremendous results in a short period of time! To schedule a consultation, call us in Cary at 919-467-2203 or Holly Springs at 919-600-6262 or fill out our convenient online request form!